In the past, many patients have been told, “You don‘t have enough room for a dental implant,” or “You‘ll need a bone grafting procedure before an implant can work.” Dental science continues to advance, and narrow diameter implants, also known as mini-implants, are turning the impossibilities of the past into the realities of today. Mini-implants are not new. FDA approval occurred in 1999, 19 years ago, and the implant team at New York University has published an impressive 14-year follow up on mini-implants that shows equal success rates to larger implants (95 percent success). The study also showed successful aesthetic and restorative outcomes with very high patient satisfaction. A different 17-year study has shown the same results. Mini-implants can now be used in any area of the mouth to replace individual teeth, or support bridgework, or even entire full-arch reconstruction. There are many significant advantages to mini-implants, one of the greatest is less surgical trauma. Larger implants require the gums to be cut wide open and a hole drilled into the bone, then sutures are placed. Mini-implants require no scalpel cut and no sutures. Bleeding is minimal; nearly zero. Placement of a single mini-implant can often take only 15 minutes, sometimes even less. Mini-implants can often be loaded immediately. 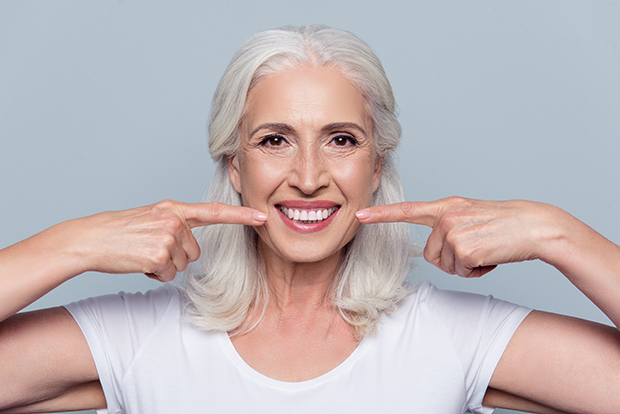 This means the dentist has the option to put in place a tooth over the mini-implant right away without the usual waiting period of three or four to six months of healing that is commonplace. Another great advantage for the public is the considerably lower cost than traditional implants. It is not unusual for the “mini-implant, plus tooth fee total” to be over thirteen hundred dollars less expensive per tooth than current larger implant, plus tooth fees. This cheaper pricing opens the door to more people being able to afford implant procedures which are often viewed by the public as quite expensive and sometimes even cost prohibitive. Of course, fees vary. Robert Gangi of Shatkin First Dental Lab in Amherst, New York has reported his lab has created 500,000 crowns for use with mini-implants and that 200,000 of these crowns have been for the bicuspid and molar area as individual crowns and bridges. Dr. Todd Shatkin, Professor Emeritus of the International Academy of Mini Dental Implants, who has placed over 20,000 mini-implants, published the 17-year study reporting mini-implant success rates of over 95 percent. He has personally trained over 5,000 dentists to do mini-implant procedures in all areas of the mouth for individual crowns, bridges, full-arch reconstruction, and denture retention. Apex Dental Solutions has trained thousands more dentists in the use of mini-implants for all areas of the mouth. Just as the evolution of arthroscopic surgery has miniaturized modern medical surgery, mini-implants’ time has fully arrived, giving patients more options than ever before. For more information about mini-implants or to schedule a dental check-up, you may contact Jeffrey Jones, DDS, LLC at 309-454-5830, or visit www.implantandcrown2650.com or www.jeffjonesdentistry.com. Jeffrey Jones DDS, LLC is located at 305 S. Linden Street in Normal. Dr. Jones is a general dentist and provides state-of-the-art dentistry for all ages.